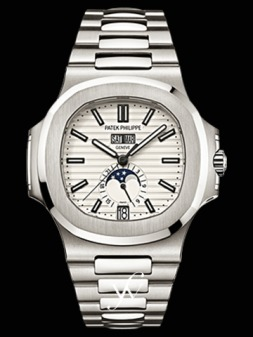 The Patek Philippe company stands for quality and reliability. As an illustration, each single automatic movement manufactured by the company is put through approximately 600 hours of quality control. The assembled watches are then taken through severe testing and observation for 15 days to one month (depending on the type of movement) before they are deemed ready for the customer. Perhaps due to this concentrated attention on each watch, only 30,000 watches are produced annually, in small series ranging from a few to several hundred. * The company released one of the first crown wound pocket watches in 1839. (Prior to this, pocket watches were wound with a key.) This invention earned the company one of its 70 patents. * In 1868, Patek Philippe made the first ever wrist watch. * In 1925, the company created the first wrist watch with a perpetual calendar, though it was not produced until 1941. * Patek Philippe is the only Geneva watch manufacturer receive the Geneva Seal, the highest official quality distinction in the watchmaking industry, for its mechanical movements (95% of the movements bearing the Geneva Seal are Patek Philippe timepieces). * Among the 100 most expensive watches sold at auction, 80 were from Patek Philippe. Calatrava The Calatrava is easily the most popular line in the Patek Philippe collection. It is a classic round wristwatch, with hobnail bezel, Roman numerals, and a beautiful porcelain white dial. Water resistant to 80 feet, the 18-karat gold case also includes a manually wound mechanical movement. Both the men's and women's models come in handwound, mechanical, or quartz movements. The newest Lady's model incorporates four concentric rings on the bezel and the hour markers reflect this motif. Gondolo A square model with a picture-frame bezel, this elegant watch contains a simple dial with Roman quarters. This timepiece has a quartz movement and a sapphire crystal on an 18 karat yellow gold case, with a choice of leather strap or bracelet. Patek Philippe's Ref. 5146 Many watches in the Patek Philippe Collection have unassuming "Ref." numbers to distinguish them from each other, but the starkness of the numbers should in no way mask the elegance and style of these lines. The 5146, for example, is an Annual Calendar watch that is a favorite among customers. Its 39 mm case is slightly larger than normal, offering a greater presence on the wrist of the proud owner. The dial is creamy white and the recessed subsidiary dials have circular guilloche patterns that serve to augment the depth and the sunburst dial enhances light. This watch has a brown, hand-stitched alligator strap fitted with an innovative 18K yellow or white foldover clasp.